It's 10:30 PM, so this still qualifies for Applique Tuesday. If you've read my previous posts you know of some of the things that have kept me busy - quilty, health, kids or otherwise. Somehow I did get to some applique. Alas it wasn't to any of my three projects I want to work on. Here's the Block Lotto block for September. Although we can enter nine, I made one as there was that cursed paper piecing to contend with - and this time I was having a dickens of a time until I realized that while the pieces were the same size (the reds) I had to use the reverse of the template to make the second one on each fourth of the pattern. 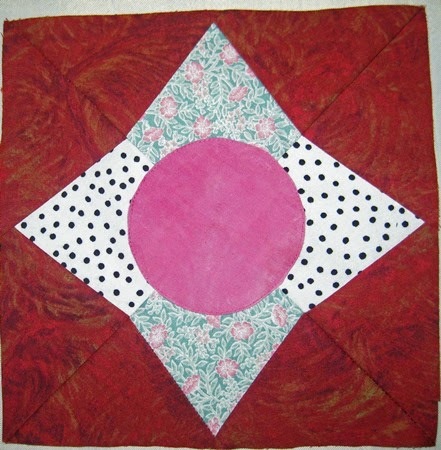 The circle is machine appliqued. I took on another commissioned quilt. 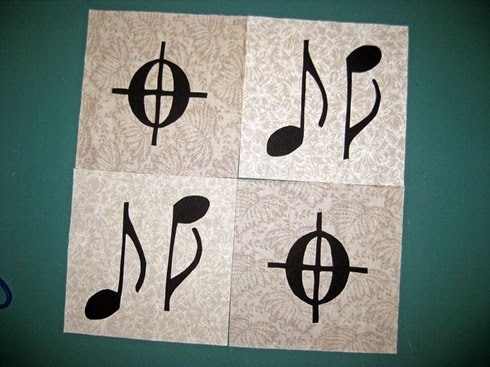 Here are four of the accent pieces for the quilt. They are raw edge applique. Need 14 of these for the quilt. Can you guess what the fabric is I will be using? An envelope of goodies to who guesses right. What in the envelope? That's a surprise. That's my applique for the week except for the few stitches I did on my Anna's Garden block. What are you working on? Would love to see your eye candy. Leave me a comment and I'll drop by. Beautiful music notes but I think the fabric will involve music instruments. Enjoy!